Samuel Spade's jaw was long and bony, his chin a jutting v under the more flexible v of his mouth. His nostrils curved back to make another, smaller, v. His yellow-grey eyes were horizontal. The v motif was picked up again by thickish brows rising outward from twin creases above a hooked nose, and his pale brown hair grew down—from high flat temples—in a point on his forehead. He looked rather pleasantly like a blond satan. We have the transvaluation of values that gives us Satan as hero, we have the artistic formalism that describes a human face as a geometric phenomenon, we have the queer overtones of a sexily boyish heroine, and above all we have the bored, jaded irony in the narrator's tone, his blasé patience in physical description, as if he had all the luxe, calme, et volupté in the world. The Maltese Falcon is, moreover, an artistic experiment—which should perhaps come as no surprise since it was written in the modernist moment, when those other legatees of aestheticism, such as Joyce, Woolf, Stein, and Hemingway, were reinventing the shape of narrative prose. 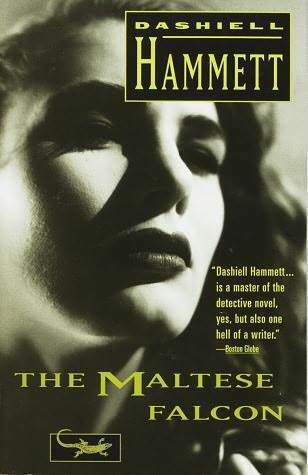 Like the last-named modernist, Hammett strips his novel of anything but description and dialogue. At no time do we enter a character's consciousness or see through one's eyes. The narrator is a camera, not metaphorically, as with Isherwood's contemporaneous experiment in objective (albeit first-person) narration, but literally in that Hammett only reports surfaces and actions; we are left to infer what anyone is thinking or what any of it means. The complicated plot of this pioneering noir novel is hardly worth recording in any detail. It is a shaggy-dog story about P.I. Sam Spade's recruitment by the faithless femme fatale Brigid O'Shaughnessy to help her recover the title bird—a treasure that once belonged to a Templar-esque order of former Crusaders, and which is now being hunted around the globe by a rivalrous group of high-end thieves. Three murders and a lot of trouble with the police later, Spade ends up in an almost ritually slow stand-off with the criminals until the falcon proves elusive and Spade proves even colder than frigid Brigid. [Effie's] voice was queer as the expression on her face. "You did that, Sam, to her?" He nodded. "Your Sam's a detective." He looked sharply at her. He put his arm around her waist, his hand on her hip. "She did kill Miles, angel," he said gently, "offhand, like that." He snapped the fingers of his other hand. She escaped from his arm as if it had hurt her. "Don't, please, don't touch me," she said brokenly. "I know—I know you're right. You're right. But don't touch me now—not now." Spade's face became pale as his collar. I wish I had read this novel earlier, if only to appreciate how much Pynchon borrows from it for my beloved Crying of Lot 49 : the early modern secret society, the absent quest object, the California paranoia, even the aestheticism and modernism (as when Pynchon alludes to Pater and Varo). Yet Pynchon also almost certainly rebukes Hammett when he has Oedipa Maas, a kind of older and wiser Effie Perine, experience a moral epiphany rather than an immoralist betrayal on the nighttime streets of San Francisco. Postmodern literature rises in humanist rebellion against the pop fiction it was supposed to have uncritically incorporated with the late-20th-century collapse of cultural hierarchies. But how did pop fiction get so decadent in the first place? Didn't learned literary sociologists assure us that the art for art's sake or immoralist attitude was the response of elite cultural producers to the popular market's indifference to their wares? Isn't aestheticism an elitist last-stand of high literature before its overwhelming by mass literacy and mass media? Didn't Baudelaire and Flaubert invent decadence to invert the moralistic judgments and easy aesthetics of the mass market? Didn't they (per Pierre Bourdieu) construct modern art as "the economic world reversed"? The answer, which I've written about before, is one of those observations so simple you can't make it unless you forget much of what you learned—or unless you never even bother to learn it in the first place, which is my recommendation re: literary sociology. The answer is this: when you subtract external spiritual, ethical, or political determinants from art, you get two precipitates, which themselves can be combined or separated. They are formalism and entertainment: art that obeys only its own inner logic and communes only with itself, or art that exists only to provoke sensation of whatever sort in its audience. The first person to understand this, Edgar Allan Poe, single-handedly invented both avant-garde poetry and popular genre fiction. Since Poe created modern detective fiction, Hammett is his legatee. And he knows it: the strenuous queer-bashing and Orientalism of his narrative is an unmistakable case of misdirection and disavowal: he's well aware of his sources. For Hammett, modern literature is, like the object for which his novel is named, a glittering treasure from another century painted black and thrown into the pitiless jostle for wealth and power. But Hammett's irony does not stop at such a conservative lament. Gutman explains to Spade that the Crusaders who built the bird themselves wanted only wealth and power; the reputed faith or humanism of the past was a charade, while noir cynicism was always the truth, even in the Middle Ages and Renaissance. Furthermore, the only Maltese Falcon we ever see in the novel is a forgery: when Gutman scrapes off the black enamel, he uncovers only lead. In this respect, the object is like the novel is like the hero. The book is a formalist experiment with no philosophical depth. And for most of the novel's length, we suspect Spade's Satanic exterior to hide a heart of gold, but no: as Brigid and Effie discover, he's cold to the coeur. Plato thought poetry was divine madness, Aristotle thought it was moral mimesis, but Hammett asks a question that provokes even a postmodern pasticheur like Pynchon to blanch: what if art is all surface, a worthless artifice that inspires only mindless greed (when it comes in the guise of entertainment) or false devotion (when it presents itself as formalism)? In which case, why not popular fiction, the worse the better? Not because, as the clown lisps in Dickens, "People mutht be amuthed," but because trashy bestsellers reveal that the whole enterprise was rotten from the start. Sign into Goodreads to see if any of your friends have read The Maltese Falcon.